Investing to Serve: Legacy of Caring With the development of a $250,000 restricted fund we will be able to secure and sustain the operations of our facility in perpetuity. At that level, monthly dividends would pay the monthly costs of operating the facility, paying the utilities, and all those items involved in operating the physical plant. (Dividends are already paying some bills.) That way, in the future, we will just need to raise funds for operating our programs serving our neighbors. We have raised over $102,000 already! Won’t you join us in this great act of stewardship? Gifts of all sizes help; the Legacy Brick is just one option. 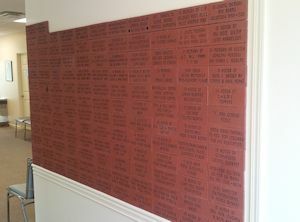 Each brick is available for a $100 donation to the FCHUM “Investing to Serve: Legacy of Caring Sustainability Campaign” (A major effort to build a sound financial foundation to sustain the work of ministry in the facility with which we have been blessed.) Create your own legacy by remembering FCHUM in your will. 4” x 8” Engraved Brick Order Form – Download this 32kb Adobe Acrobat PDF form to submit your donation!